NI Farm Forestry was established in 2001 by Tony Johnston with the initial intent to grow Christmas trees for the wholesale market. This morphed rapidly into the provision of contract planting of woodland for others. Over successive years NI Farm Forestry have grown to become the preminent forestry establishment operation in Northern Ireland. NI Farm Forestry now owns or manages 8 Christmas Tree plantations growing a range of trees to meet both the wholesale and retail markets. 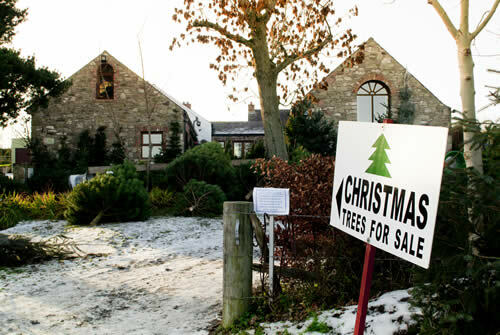 It currently is producing over 4,000 Christmas Trees every year from the 70 acres of plantations located throughout Northern Ireland. A small family business, we currently have 6 full time forestry workers who carry out the day to day maintenance of the woodlands we are trusted to manage. In addition we employ up to 10 part-time and temporary staff for larger planting projects and to run the Christmas Tree shop which opens every year at the end of November. Tony and NI Farm Forestry are qualified and registered to carry out the full range of forestry and woodland operations. Tony is a Chartered Forester and NI Farm Forestry is a leading member of CONFOR, and a member of the Irish and the British Christmas Tree Growers Associations. He previously chaired the Irish Christmas Tree Growers and represents Forestry on the Rural Development Programme Monitoring Committee and the DAERA Plant Health Stakeholders Group.